Are you sworn to the black? Well, then you’ll be happy to hear that the final Blastfest headliner for the sophomore edition of the festival will be none other than the Swedish legions of the black light, Watain! Prepare yourself for fire, brimstone, and the real deal; carcasses, blood, foul stench and hatred in abundance. Lawless darkness commence! Blastfest bring you a nice little platter of splatter! Schrinec Does Pungent Stench! They will be playing the twisted material from the Austrian cult band’s first three albums. Basically there’s going to be some proper old school death metal coming your way. Norwegian Grimfist released two highly-acclaimed albums around the turn of the century, and seemed to disappear into obscurity not long after. But lately, they’ve been at it again, flying high the banner of brutality! 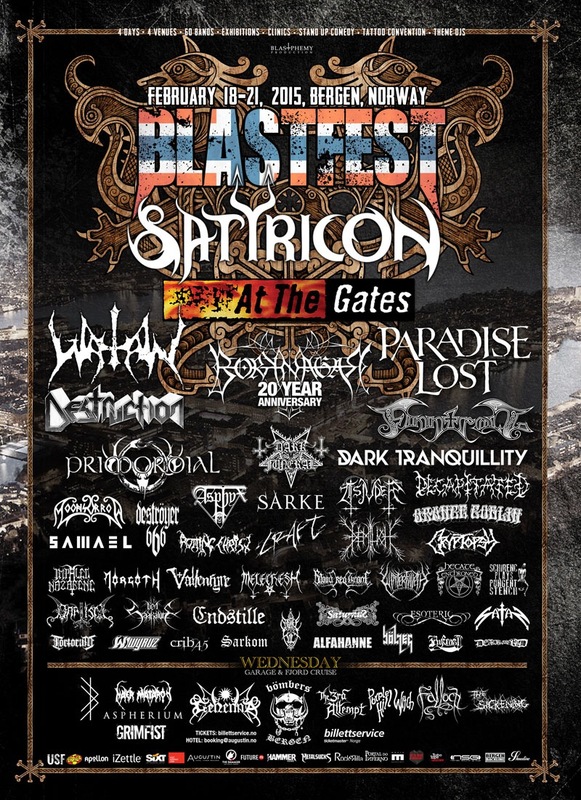 At Blastfest 2015 they will be doing their first show in eight years with an as-of-yet still undisclosed new lineup. You’re probably in for yet another all-star Norwegian ensemble!